Without proper drainage in place on your property, water may pool, drowning expensive plants, destabilizing structures and transforming your garden—or your basement—into a perpetual swamp. The simplest and most cost-effective remedy for eliminating foundation leaks in basements is proper drainage. We can resolve these leaks by re-routing your home’s gutter downspouts to drain away from the foundation. Names: PVC pipe, PVC drainage pipes. Delivery: We are able to deliver all bulk material, drainage pipes, mulch, aggregate stone and decorative stone to NJ, PA & NY. Delivery charges are a function of the type of materials, the volume of materials, as well as the distance (from our Pennington, NJ location) to your site. Please phone us and we can discuss the particulars of your needs. Installation: Gregs Landscaping can also install drainage pipes. 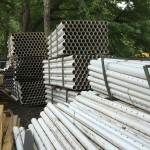 For more information about pricing and delivery of drainage pipes, please contact us. Gregs Landscaping supplies Drainage PipesBulk delivery of drainage pipes is available in New Jersey, Pennsylvania, and New York. Free delivery for qualifying orders*.